Sometimes I get questions about reading and knitting at the same time. Here are a few tips on how to make that a little easier. 1. 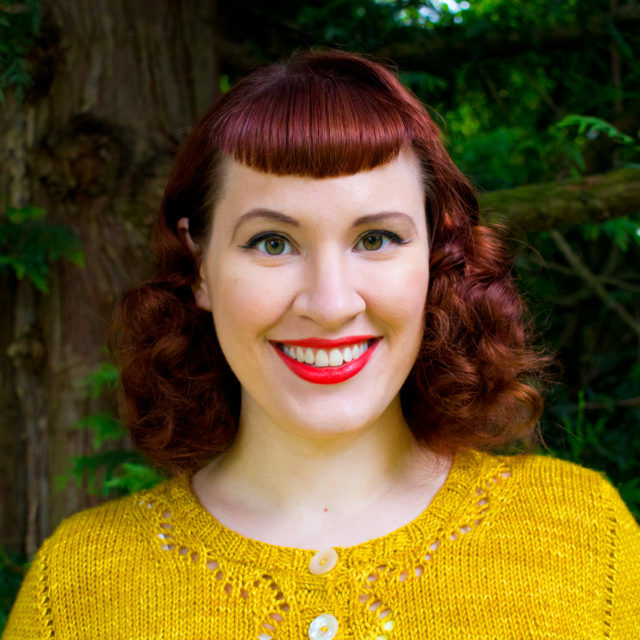 Pick the right knitting project. I typically only knit simple parts of projects when I’m reading because that’s all I can manage without having to check my knitting frequently. 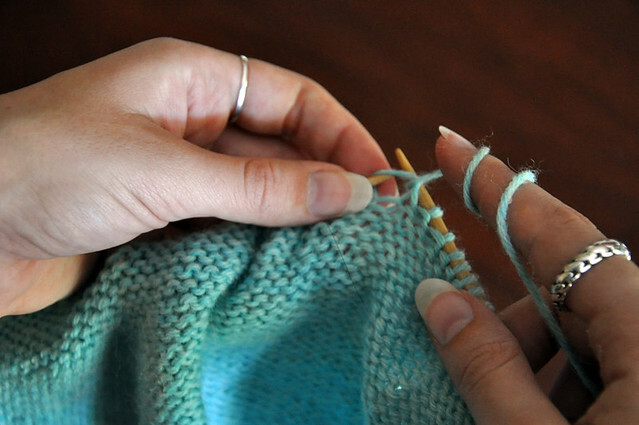 I mostly stick to unshaped stockinette or garter stitch, but working shaping is possible if you use markers. I haven’t figured out how to crochet without looking at my work a lot yet. 2. Look for large books to read. Text book sized books are the best because they lay flat and open without a lot of effort. If you’re not reading a comic book, large books also have the bonus of containing more text per page so you don’t have to pause to turn the page as often. 3. Use a weight if your book won’t stay open on your own. You can buy things to help hold your book open, but I find that a simple metal ruler does the trick. Plus, it makes it easy to check my gauge if I’m reading while I’m swatching! 4. Accept that you might do some damage to your book. You might break the spine trying to get your book to lay flat. That really bothers me, but it happens and it doesn’t make the book any less readable. 5. Read things digitally and don’t worry about the pages. You can set your computer to scroll gradually by clicking with the scroll button on your mouse. The scroll-y symbol will appear on your screen where you clicked and you can offset your mouse to control how fast or how slow your computer will scroll. 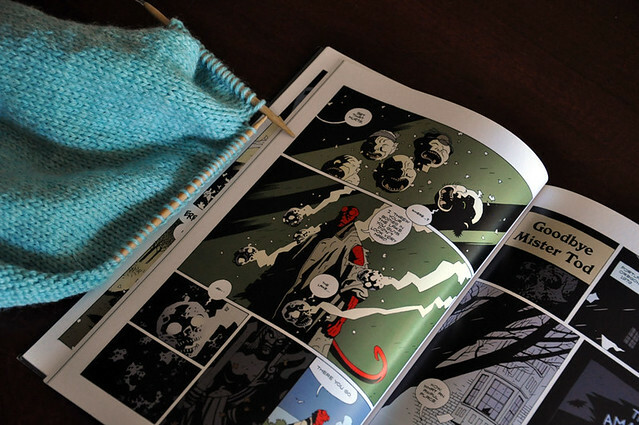 Reading materials in order of appearance: Hellboy, Definitely Dead, Sabriel, The Makers Project. This is great! 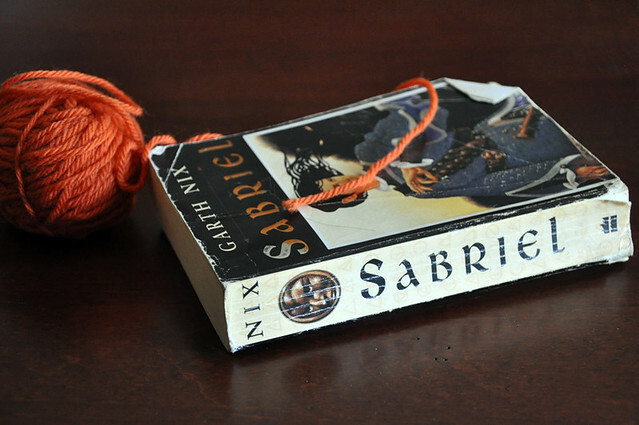 I just recently delved into the world of reading while knitting and sewing. 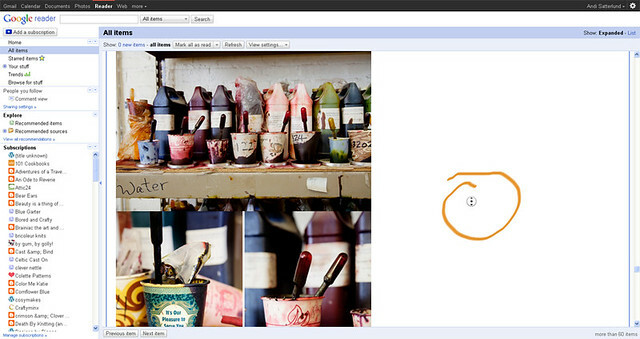 I love your tip on using google reader. Great way to multitask! I’m finding that reading on my Kindle works with knitting. No trying to get pages to lie flat. I also use my google reader with the “next” function (but I can’t remember how I set it up). I just listen to audiobooks. I used to be a bit snobby about them but honestly I can’t remember why now. I love audiobooks, but a lot of my reading for school isn’t available in that format. I started knitting while reading in grad school and discovered that it really helps me to focus because my hands are busy. Now I can’t not knit while reading which has made for some really interesting moments in the library. Great tips! 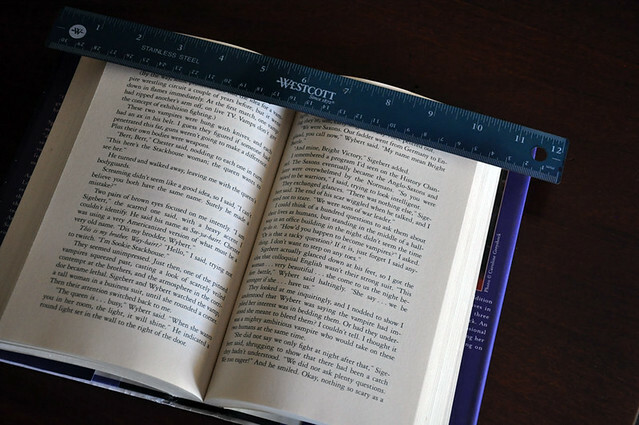 I especially love the idea of using a metal ruler to keep the pages flat. I bought one of those gimble things months ago to do the same thing, but it can be really fiddly to turn the pages with it, especially if it’s a thick book. The ruler sounds like it’d be so much simpler! My mom knitted and read most of the time. I used to and have gotten out of the habit. I’m behind on my reading and your post is going to come in handy. I often use a big rubber band to hold my book open, but you weight idea is much better, and I’m embarrassed I haven’t thought of it before hand…. This is going to catch me up on my reading quite a bit. I’ve heard rumors about magical people who can knit and read at the same time. Now maybe I can become one of them!! Thanks!! I’m a student and I have so much to read that I’m going into knitting withdrawal. I’m trying this right away! !